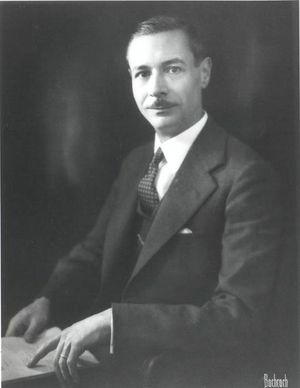 Haraden Pratt, IRE President, 1938, served as vice president and general manager of the International Telephone and Telegraph Company. Haraden Pratt was born in San Francisco, CA, on 18 July 1891 and graduated from the University of California in 1914. Both his parents were telegraph operators and he learned Morse code at an early age. He worked briefly as a wireless operator on ships before entering college and during summers while he was an undergraduate. Soon after his graduation, he joined the American Marconi Company and helped to install a transpacific station in Bolinas, CA. In 1915 he left Marconi to take a job as a radio expert at the Mare Island Navy Yard. He installed radio equipment on Navy ships and installed and maintained shore stations on the West coast until 1918 when he was transferred to Washington, DC. In 1920, Pratt joined the Federal Telegraph Company in Palo Alto, CA, and designed a system for commercial radio telegraph service. In 1926, the Congress passed the Air Commerce Act which provided funds for development of radio aids to air navigation. J. Howard Dellinger of the Bureau of Standards offered Pratt the opportunity to help develop a suitable system and he worked with Harry Diamond and others on the radio beacon during 1927-1928. In 1928, Pratt accepted an offer to become chief engineer of the recently organized Mackay Radio and Telegraph Company which subsequently was acquired by the International Telephone and Telegraph Company. He remained with ITT until 1951 and became a Vice President and General Manager. Pratt joined the IRE in 1914 and became a member of the IRE Standardization Committee in 1928. He became an IRE Director in 1935, served as the President of the IRE in 1938, and was Secretary of the Institute from 1943 to 1965. He was awarded the IRE Medal of Honor in 1944 "In recognition of his engineering contributions to the development of radio, of his work in the extension of communication facilities to distant lands, and of his constructive leadership in Institute affairs," and the Founder's Award in 1960. Pratt served on 25 Institute committees and became the first Chairman of the IRE History Committee when it was formed in 1956. The Haraden Pratt Award was established in 1971 by the IEEE to recognize individuals for their service to the Institute. During World War II, Pratt was a Division Chief in the Office of Scientific Research and Development and was Chairman of the Radio Technical Planning Board from 1945 to 1949. He was an official observer of the atomic bomb tests at Bikini in 1946. He served as telecommunications advisor to Presidents Truman and Eisenhower during 1951- 1953. Pratt was a Vice President of the American Cable and Radio Company from 1953 to 1958. He died in August 1969 at age 78. This page was last edited on 7 October 2016, at 14:16.